Carrier from birth up to approx. 5 years. 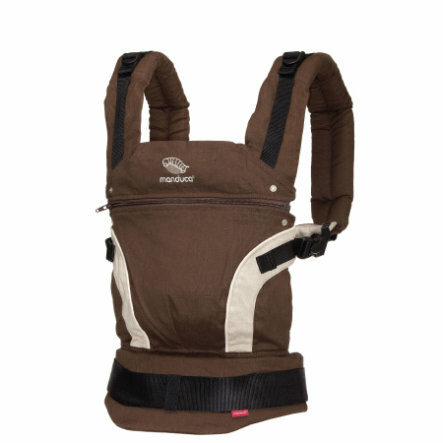 The manduca® lets you carry your baby close to you, almost like in a wrap sling. The manduca® is designed to be kind to parents‘ backs; the anatomically shaped waist belt redistributes the weight from the shoulders to the hips, making babywearing a blissfully comfortable experience. The padded shoulder straps can either be crossed over on your back for a front carry or used in simple ‚rucksack‘ style for both front and back carries – just as you prefer. The belt, meanwhile, is suitable for wear on the hips or the waist – always a fabulous fit! Even newborns (from 3500g) are held safely in the integratedinsert to reduce seat size, while from about 3-5 months your baby can be carried without the insert, in the ‚M‘position typical of wrap slings. A hidden head and neck support can be unfolded when necessary, to cradle your sleeping baby’s head, and an ingenious extendable back provides great support for bigger children (up to 20kg). Shoulder straps that can be adjusted in three different ways and the infinitely adjustable waist belt make the manduca® perfect for parentsof all sizes. We use nothing butthe best, carefully selected materials. All materials are produced and dyedto our specifications and all fixtures and integrated accessories are subject to strict criteria. Manduca FumBee Belt Pad brown, 2 pcs.